Arthritis is an inflammatory condition that affects the joints, causing swelling, stiffness, limited mobility and pain. PubMed Health says approximately 37 million people in the U.S. have arthritis, which equates to almost 1 out of every 7 individuals. Treatment for arthritis varies, depending on the type of arthritis you have. It can involve prescription drugs, over-the-counter medication, topical creams and herbal remedies. Diet might also play a role in relieving arthritic symptoms. Cherries have both anti-inflammatory and antioxidant properties that might help arthritis. Arthritis occurs when the cartilage of the joints breaks down. Without proper cartilage, which is connective tissue that protects the joint, the bones will rub together. This can cause stiffness, pain, pressure, redness and swelling. Arthritis can develop due to an injury such as a broken bone, autoimmune disease, normal wear and tear from physical activity, and from an infection. Sometimes, if the arthritic pain is being caused by an injury or an infection, once the condition heals, the arthritis will dissipate. However, with normal wear and tear and certain diseases, arthritis can become a lifelong condition, eventually leading to severe inflammation and possible deformity. One of the most common forms of arthritis is known as osteoarthritis and usually develops in the fingers, hips and knee joints. Typical treatment is a combination of medications such as nonsteroidal anti-inflammatory drugs; capsaicin cream; supplements such as glucosamine, chondroitin and omega-3 fatty acids; exercise; physical therapy; and dietary changes, including eating lots of fresh fruits and vegetables. Cherries might have active compounds that can help relieve arthritic pain. Sour cherries, botanically called prunus cerasus, and sweet cherries, or prunus avium, are native to Europe, but now can be found all across the U.S. The sour or tart cherry is much smaller than a sweet cherry, but both appear to have anti-inflammatory properties and are chock-full of nutrients. Cherries contain vitamin A, vitamin C, potassium, calcium, iron, phosphorus, amygdalin, malic acid, citric acid, tannin, quercetin, anthocyanin and cyanidin. With all the antioxidants cherries contain, they might have the potential to reduce inflammation, slow cardiovascular disease, inhibit tumor growth and reverse the aging process. According to Drugs.com, sour cherries, because they contain high levels of the active ingredient cyanidin, might be 10 times stronger than aspirin in fighting inflammation without the risk of side effects. The evidence, thus far, has shown both sweet and sour cherries to be very effective at relieving arthritic symptoms, including swelling and pain. A preliminary study done in 2003 by the U.S. Department of Agriculture showed that eating Bing cherries may help reduce the inflammation caused by rheumatoid arthritis, showing blood markers for inflammation significantly lower after consuming the cherries. In a study done a year later and published in the May issue of "Agricultural Research," scientists found that eating 45 fresh Bing cherries for breakfast reduced levels of nitric oxide, which is one of the biochemicals which, if elevated, damage arthritic joints. In another study published in the September/October 2006 issue of the "Scandinavian Journal of Rheumatology," clinicians found that it was the compound anthocyanin, found in sour cherries, which is responsible for relieving the inflammation associated with arthritis. In 2007, researchers from the Baylor Research Institute also confirmed that tart cherries have the ability to relieve the pain of osteoarthritis. More than half of the patients in this study experienced a significant improvement in pain and function after using a cherry supplement for just eight weeks. 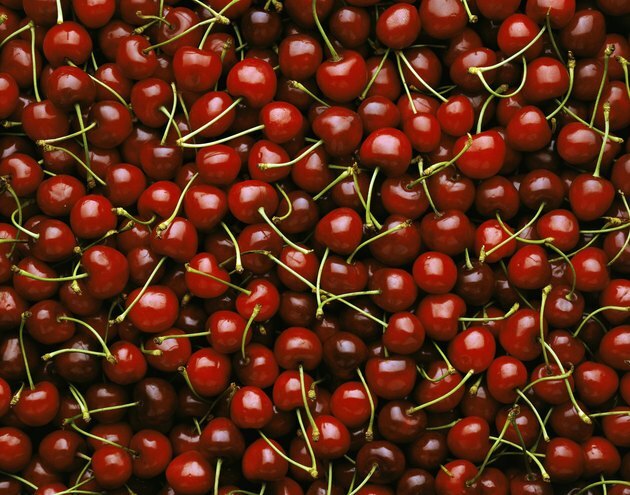 In addition to arthritic pain, cherries have also been shown to relieve certain muscle pain. In a study published in the May 2010 issue of the "Journal of the International Society of Sports Nutrition," tart cherries displayed a protective effect on muscle pain and damage during strenuous activity. During this study, 54 runners were given two 355 mL bottles of tart cherry juice or a placebo cherry drink per day to consume over seven days prior to a race. After the participants completed the race, those who drank the cherry juice found a substantial reduction in the amount of pain they normally felt as opposed to those who used the placebo and found that it minimized post-run muscle pain more quickly. Science Daily: Can Cherries Relieve The Pain Of Osteoarthritis?